Well done and a big thank you to the team, who put on a fantastic event last week with their Early Years & Primary Schools programme at Gordon Barracks, Aberdeen. The event fed in nicely to Techfest’s Activity Weekend, which was open to the public and saw hundreds (if not thousands) of kids getting involved with STEM (Science, Technology, Engineering and Mathematics). 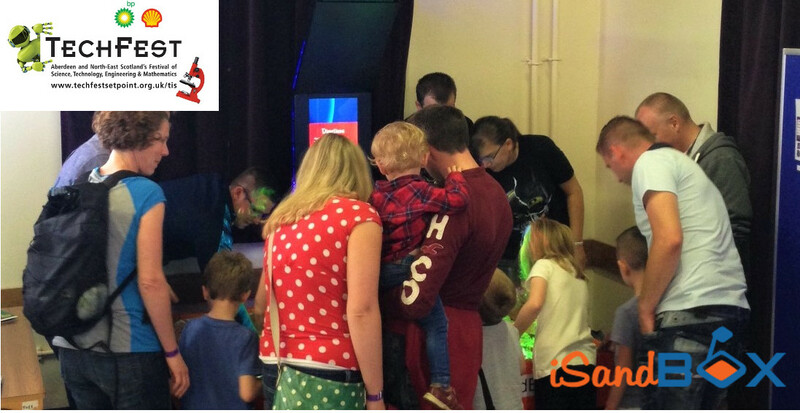 There were some fantastic exhibits along with inspirational speakers and interactive workshops running throughout the week and the whole team at iSandBOX was proud to be a part of it, showcasing our interactive sandbox. Sally Mackinnon, from iSandBOX, ran some iSanadBOX activity sessions for ten schools, with over 200 children taking part, who learned about volcanoes, contour lines, eco systems and the importance of interacting as a team with our sensory game. Over the course of the week, iSandBOX received great feedback from the kids taking part. THANK YOU Techfest and thank you to all the delegates for visiting. We had lots of fun!